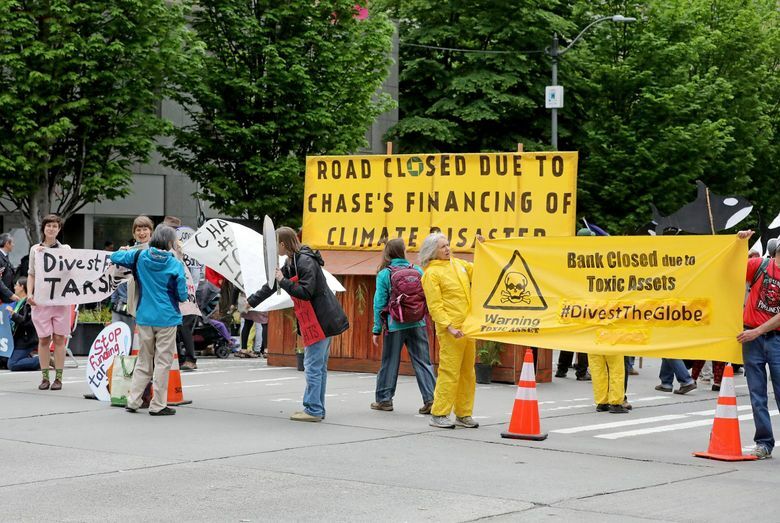 Demonstrators shut down traffic downtown and a local JPMorgan Chase bank branch to protest harm to climate and indigenous communities from tar-sands pipelines. More than 25 women holding red roses drummed and sang in the lobby of the Russell Financial Center, calling attention to missing and murdered indigenous women, and saying that men who moved to remote camps to construct pipelines contributed to violence against indigenous women. In a prepared statement, JPMorgan spokeswoman Darcy Donahoe-Wilmot said the financial institution “has a long history of advancing environmental sustainable solutions for clients and its own operations. 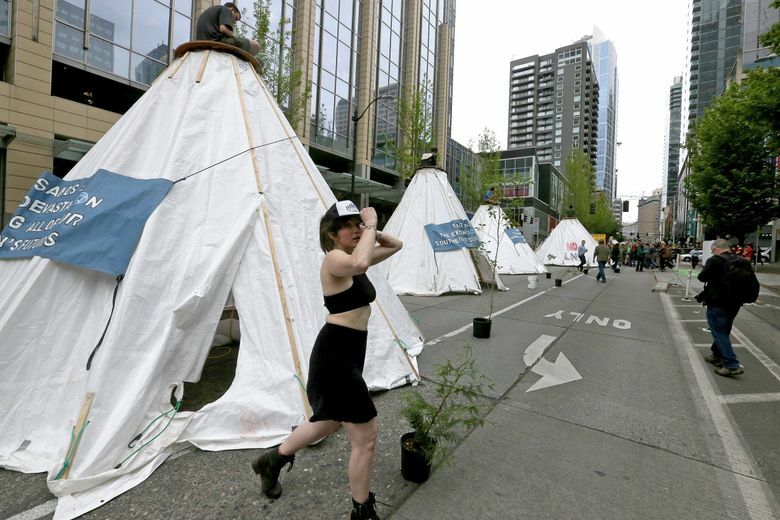 As opponents filled the lobby with drums and song, demonstrators sat atop 14-foot-high tepees — actually called “tarpees” because they are made of white plastic tarps and lumber — in the middle of Second Avenue, burning sage as speakers took turns speaking out against the pipeline. Dressed as the Lorax, kids with Plant for the Planet, a nonprofit, youth-led climate justice group, shouted, “Unless someone like you cares a whole awful lot, it’s not going to get better. It’s not,” the closing line of the book “The Lorax” by Dr. Seuss. Danny Lange, 23, of Seattle was among four demonstrators on the tarpees who refused to obey the commands to disperse. 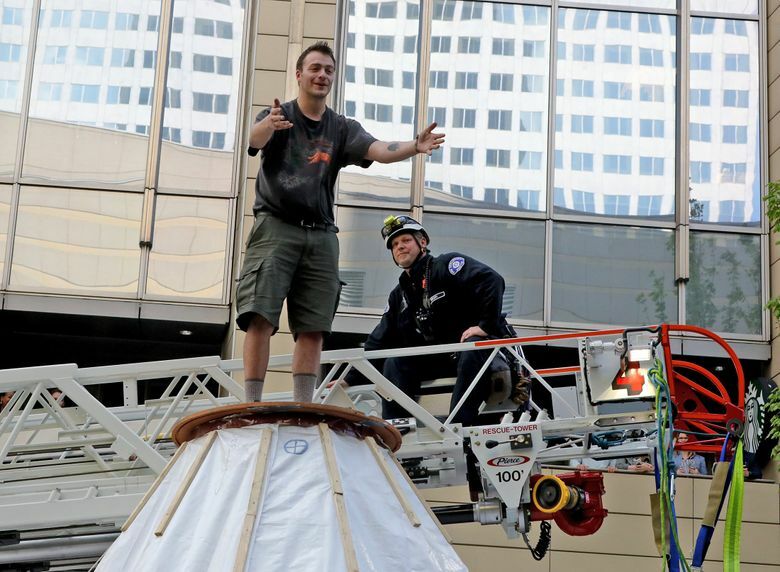 A Seattle Fire Department ladder truck extended to the top of his tarpee to extract him. He politely refused to leave the tarpee top, and the officer retreated. Lange continued to perch atop the tarpee alongside the others, using a cigarette to sprinkle the tarpee top with tobacco, as a traditional Native American blessing. Lange said he was not afraid of arrest and was committed to doing what he feels he must for the planet. He had never been arrested before, Lange said, but it became time to take a stand. “You can’t do this with fear,” Lange said. “I’m doing this to protect our children and grandchildren, the trees, the salmon and all the native species.” Lange was eventually coaxed into surrendering and was taken into custody. The Chase bank branch was shut down, the handles removed from the door facing Second Avenue, and only one employee visible inside. Some were disgusted — not necessarily with the demonstrators’ message — but with the inconvenience and cost to taxpayers of the demonstration. Others said inconvenience was the only way to get the public’s attention. “Some sort of action needs to take place; until we have a better plan, this is what we have to work with,” said David Israelievitch, of Seattle. As he talked, demonstrators walked up and down the sidewalk carrying painted wooden orcas on sticks, a moving pod of endangered whales floating above the concrete of downtown. Lynda V. Mapes: 206-464-2736 or lmapes@seattletimes.com. Lynda specializes in coverage of the environment, natural history and Native American tribes.